This entry was posted on Sunday, December 28th, 2008 at 8:40 pm	and is filed under Main Dishes, Super Natural Cooking, Vegetarian. You can follow any responses to this entry through the RSS 2.0 feed. You can leave a response, or trackback from your own site. This recipe sounds so interesting. The grapefruit is scaring me a little, but I love adding fruit to everything. Lovely picture. I love to make risotto using pearl barley. I am so with you on eating lighter. I feel like a beached whale after this holiday season Happy New Year! 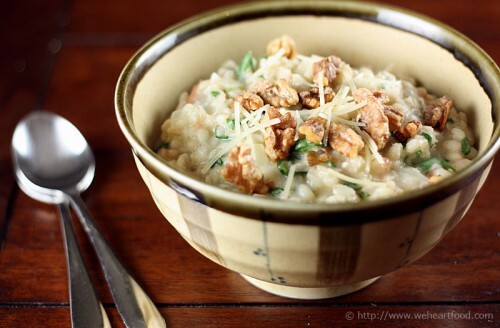 Oooh, I’ve never had barley risotto, but I do love barley and I do love risotto, so I’m sure I’d love this! Looks great! Great photo… I feel the TASTE!!! !